Q: What do I need in order to rent a bay at ADIYG? A: To rent a bay in our garage you need to be at least 18 years of age, have a valid driver’s license and read and sign our waiver. Persons under the age of 18 must be accompanied by an adult and that adult must fill out and sign the waiver for the child. No young children (12 or younger) are allowed on the shop floor without special permission. Closed toed shoes are required at all times and it’s encouraged that long hair be tied back, loose clothing tightened up or rolled up and eye protection be worn at all times. Q: Now wait, wut? How’s this work? A: It seems a lot more complicated than it is: You simply come in, tell us what type of bay you need and what you’ll be doing. Fill out a waiver if you haven’t done so, we enter you into our system and print out specifications for your vehicle (if available). We’ll throw all of that onto a clipboard and walk you out to the bay while one of our staff pulls your vehicle into the shop. Depending on which type of bay you’re using, we’ll pull into either a flat bay or into a lift bay where we’ll get it up on the lift for you. We’ll point out the locations of the bathrooms, the water fountains, fire extinguishers, tool crib and kill switches. Then we’ll go through the tool chest with you to show you that all of the tools are there and ready to go. Then we’ll turn you loose! It is a DIY garage after all! Q: Can you do the work for me? A: No, unfortunately we can’t – it is a do it yourself garage after all. While our managers and techs are trained and encouraged to help with basic knowledge, due to liability reasons we can’t wrench on your vehicle. We WILL do our best to prevent you from injuring yourself with unsafe practices however. We have partnerships with full service facilities and mobile mechanics if you find yourself in a bind or unable to move forward and will put you into contact with them if requested. Q: Do I have to be a professional mechanic to use your place? A: Negative! We’re here for the pro and the novice alike. Now, that being said, it is definitely encouraged that you have some knowledge in what you’re attempting and have done some research before attempting it, or things could get pricey in a hurry. While at our place you have access to a few industry leading subscriptions which provides full OEM repair, maintenance and real-world, experience-based information in an easy-to-use format that our staff can help you use. We have two ruggedized laptops for use at your workbench; along with our wi-fi that means you can also find nearly anything you need on online forums and YouTube. Q: Seriously, what’s up with the alpaca? A: It’s an alpaca. Alpaca’s rock. That… that pretty much covers it. Q: Is your place wheelchair accessible? A: Indeed it is, both on the shop floor and in the retail shop and bathrooms, etc. Q: Do you have a tire machine and balancer? A: Our neighbor does but we don’t, no. Sadly, in today’s society it’s too much of a liability concern above and beyond what we’re already into. With wheels being as expensive as they are, and tires going lower and lower profile we just don’t see a way to offer that to DIY’ers without it being a horror show. And the end result of this particular horror show is us being liable for way too much. Regardless of what actually happened, it’s going to be “ADIYG’s fault” if anything happens. It’ll either be our fault for not showing someone how to use it properly or it’ll be our fault for “faulty equipment.” We wanted to. We considered it. We asked around at various shops what they thought. To a shop, they hated it and absolutely didn’t recommend it for those reasons mentioned above: they spent more time fighting customers over imaginary or pre-existing scratches that a lot of them won’t do anything outside of factory sized wheels and tires any more. I’ve seen posts on various forums where guys PLAN on it, they PLAN on going to a shop JUST to complain and try to get new rims out of them. We just can’t fathom that. A balancer might be handy, but again, we’re talking about a spinning hunk of metal and rubber that could seriously injure someone if they’re not paying attention to detail. So, no, we won’t have a tire machine or balancer for a while, if ever. You certainly can take them next door for Cal to mount and balance while doing something else in one of our bays though. Q: Do you guys have an alignment rack? A: We do not. We couldn’t see the point of spending $40k on a rack that requires a large area in our shop and some pretty intensive training to learn how to use and get proper results – and then turn that over to DIY’ers. 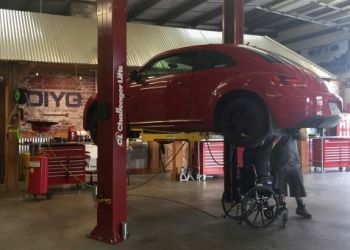 Instead we’ve partnered up with Racewerks of Virginia Beach just a few yards down the street when our customers do things that require an alignment. These guys have been doing it a long time and for lots of regular Joes as well as racing Joes – they’ll take care of you and make sure everything is good to go. And your name doesn’t have to be Joe. Q: Do I need to bring my own supplies? A: Even though it’s a DIY garage we supply shop rags and paper towels at each bay, as well as hand cleanser at locations around the shop. Other supplies are available in the store for sale or can be ordered through our portal and you’re also able to bring your own if desired. We may or may not have other greases/fluids/other items, but if you think you’re going to need it, you might want to bring it. Q: Where do you suggest I order my car parts from? A: We keep a small stock of general parts on-hand: anti-freeze, hose clamps, fuses, vacuum line and plugs, bulbs, etc. We can order parts through our system for you through our partners Advance Auto, Autozone, NAPA, Pep Boys or O’Reilly Auto Parts and have them delivered to the shop. If parts are in stock we can usually have them in hand within thirty minutes. If not we can either have them delivered to you or if prior arrangements have been made, we can have them delivered to us where we’ll hold them for you until you’re able to come in and pick them up. Q: Do you have welding equipment on-site for use? A: Negative. We’re still considering how best to go about this but until we have a way to ensure the skill level of the person wanting to weld, we don’t. We’re also concerned with liability in the case of welding being conducted on our premises not being done properly and failing, ending in injury or death. If you have your own welding gear and want to bring it along to use in our shop, bring all related safety and equipment and we’ll have a go at it. We’ve got curtains for use around the welding site at no additional charge. Q: Can I do body work here? A: You can do some body work as long as it doesn’t create a lot of dust or fumes (no heavy Bondo or fiberglass work; small stuff is okay – please ask before starting) but we can’t do any painting (outside of rattle can) due to EPA regulations. DIY garage vs DIY body shop and all that. Please see the staff before starting any painting, Bondo or fiberglass work. Q: It all sounds great – where do I sign? A: Have your license plate number handy and see our staff to read and sign the waiver (and it’s a doozy*, I’ll tell ya – thank your government for that) and they’ll check you in to a bay! *Auto shops and working on vehicles can be inherently dangerous places and past times. While we will do our very best to ensure our customers are acting in a safe manner, there’s always a chance that you’ll find a way to hurt yourself or your vehicle. We’re all adults and responsible for our own actions and the chance IS there to get hurt, so do your best to pay attention to detail, watch what’s going on around you, and stay focused and aware. If you see someone acting in an unsafe manner, bring it to their attention and to the staff’s attention. If you get hurt or see someone else get hurt, make SURE you call attention to it/them and seek help from the staff as quickly as possible. We’re a family here and we don’t want family hurt. Q: Do I have to be a member to drop off used oil or coolant? 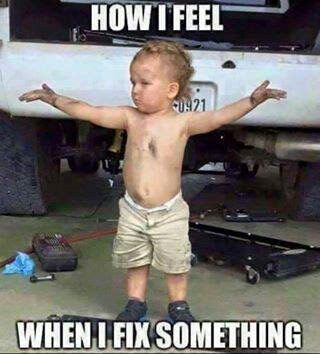 Do I have to change the fluids in your shop? A: Honestly, we’d prefer it simply because we’d have better control of the fluids that go into our tanks. The recycling types get serious heartache when two chemically disparate types of fluids are mixed (in this case any type of engine oil/transmission fluid/rear gear oil mixed with any type of antifreeze) because it destroys any chance of recycling either type. However we won’t turn anyone away as long as the fluids are in a clear bottle so it’s fairly clear at a glance if it’s oil or if it’s antifreeze. If it’s a mix then we’ll have to refer you to the Virginia Beach Recycling Center. Q: I’ve got another question! A: Hit us up by filling out this form and we’ll get back to you ASAP!